We provide quality services and repairs for a large number of auto makes, see the complete list here. Auto body repair – Trained and highly experienced technicians ensure your vehicle is repaired in only the proper manner by using the correct and up to date materials and repair procedures. 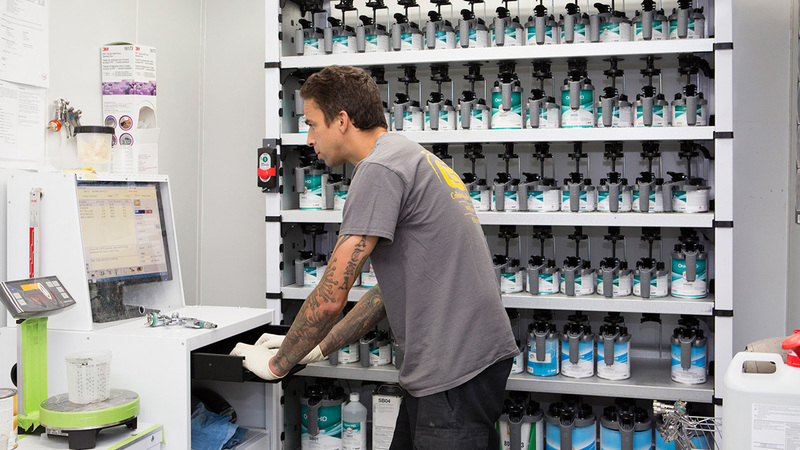 Auto body paint refinishing – State-of-art down draft paint booth system for optimal and clean conditions for applying and baking all coating applications. State of the art computerized 3-D measurement system for frame & unibody realignment – This can not be stressed as critical to verifying your car is back to with in factory tolerances for proper performance and safety. Paintless dent removal – In certain repair scenarios, it is a great way to keep the factory paint while lowering our customer’s costs. Suspension diagnostics & repair – Being able to repair your vehicle’s suspension systems in house can reduce the time away from your vehicle. Post repair re-inspection – Not sure if your vehicle was repaired correctly. We inspect auto body repairs made to your vehicle to ensure the work was done correctly and make the correct recommendations to make the repair correct and safe. Wind & water leak repair – Typically it takes great experience and expertise to solve troublesome auto water leaks, which we have here at Collision Specialists, Inc.
After being the victim of a hit and run, we took our car to CSI for the insurance claim. They are registered in the database with our insurance (USAA) and had an itemized quote ready for us in no time at all. They handled all of the paperwork with the insurance company. I recommend CSI as a fantastic locally owned and operated Collision Repair facility.